I'm basically just reposting this here so more folks read it, so please comment on Darren's post. I like this page. Perhaps these bullets could actually be a prereading for a staff as they set their goals and plans for the year. By switching them to the positive...and then implementing an action plan. Then the page could end with... I have a plan to become better as a teacher. @macdonald - that's a great idea! I like that this post talks about all the things that teachers can do to improve. All the things yuo listed seemed very helpful to becoming a teacher, but I know that most teachers do not do it. Like visiting and observing other teachers as they teach and many other things. 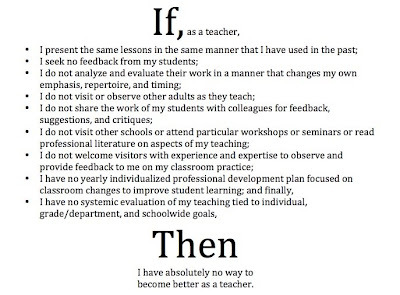 I think this is a great post because it really shows how much teachers can improve. Most of the teachers I have at AHS are really good and do most of these things, but not all of them. Like the example I said before and things like going to workshops or seminars and other schools to see how they can improve the way they teach. Last year I had a teacher that had no control over my class and you could tell that she taught the same thing every year. You could tell that she was tired of her job and was just there becuase she needed to money. She had no passion for her job anymore. All the things you listed for becoming a better teacher involve having a passion for teaching. Ms. Smith obviously has a passion for her job because she is always going to different states or conferences to leanr how to become a better teacher. I know that she does not teach the same thing every year, she grades in her own way, and she always is having people come in to our class to observe the new and different way we are learing. I think more teachers need to do this and if they do not want to, then they obviously do not truly want to become a teacher. Because they job of a teacher is very important. They are preparing the future. The students are the future and if they aren't taught properly, then the world is in alot of trouble in the years to come. So even though some people do not think that being a teacher is very important but it really is. @angelicao - While I'm sorry you had a poor experience in the past, I'm glad you've had the chance to experience Ms. Smith - she is an amazing teacher. Thanks for commenting!